INMUNOTEK acquires a plot of 3,500 m2 in the Technology Park within the Campus of the University of Alcalá de Henares (Tecnoalcala). 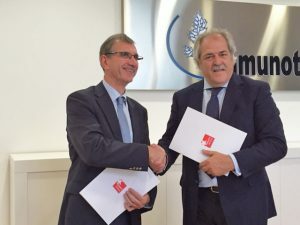 Mr. Jose Luis Subiza (INMUNOTEK SL) and Mr. Fernando Bastarreche (MADRID ACTIVA SAU), signed the agreement. With this new plot INMUNOTEK will have enough space for the expansion of its current facilities in the Technology Park.